What Is a Pullman Bath in an Apartment? The term "Pullman" in architecture comes from the work of the 19th century industrialist, George Pullman, who designed and developed high-end railroad cars with guest rooms and small bathrooms for overnight accommodations. The term typically refers to a long, narrow area in bathrooms, kitchens or other rooms in architecture. In an apartment short on space, a Pullman-style bath makes use of every available inch in the corridor-like room. Pullman-style bathrooms don't have a lot of room. The Pullman-style bath in an apartment resembles the bathroom in a Pullman railroad car, meant for the private use of those with overnight lodgings. For example, in a typical Pullman rail car room for two people, the entire length of the bathroom is about 7 feet long and approximately 3 feet wide. 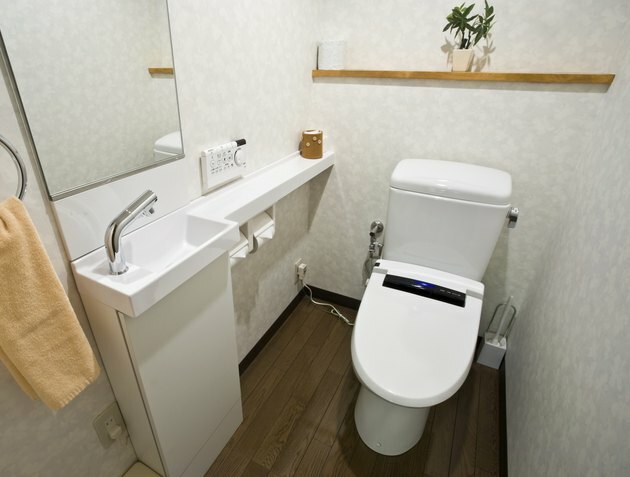 A toilet with a small sink sits at one end of its length and a small shower opposite the toilet. An apartment-sized Pullman-style bath may have a scaled-down tub or a shower at one end with the toilet close by and a sink beside the toilet or between the toilet and the tub on the long wall. One of the ways to make the space seem larger is to mount a floating sink and cabinet on the wall to free up floor space. Add wall-mounted storage above the toilet to give the room more storage, as it more than likely doesn't have enough. Pullman-style bathrooms are typically found in older vintage buildings that were converted to apartments, with plumbing and bathrooms added later. Older buildings typically did not have individual bathrooms in each room or apartment space, so to modernize them, a small hallway or closet may have been converted to a bathroom when joined with one or two other small rooms to make the apartment. Apartments such as these may also have Pullman-style kitchens, a long corridor-type room where storage and space are at a premium. Since you don't have a lot of floor space in a Pullman-style bathroom, you must make use of its vertical wall space to increase your storage. Small shelves over the toilet that don't intrude into the space can store bathroom supplies up and out of the way. A vertical mirror added to the short wall opposite the shower or tub creates the illusion of a smaller space. Add a shower or bath caddy to hold soaps, shampoos and other bath supplies.